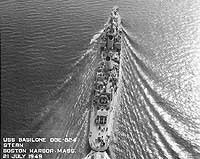 USS Basilone, a 2,425-ton Gearing-class destroyer, was built at Orange, Texas. Laid down in July 1945, less than two months before Japan's surrender brought World War II to an end, she was launched in December of that year with the designation DD-824. 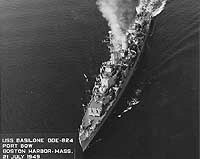 Postwar cutbacks caused the suspension of her construction, and she was later towed to Quincy, Massachusetts, for completion to a modified design, optimized for anti-submarine warfare missions. One of her original trio of five-inch twin gun mounts, and all of her torpedo tubes, were replaced with new anti-submarine weapons, including the Weapon ABLE rocket launcher and trainable mounts for Hedgehog spigot mortars. 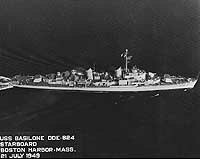 Basilone was formally redesignated DDE-824 in January 1948 and placed in commission in July 1949. The new ship then began service with the Atlantic Fleet, during which operations in the western Atlantic and Caribbean areas alternated with frequent deployments to the Mediterranean Sea and, occasionally, to northern European waters. 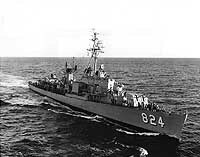 Basilone was present in the "Med" for both the 1956 Suez Canal crisis and the 1958 Lebanon intervention. In October and November 1962 she helped enforce the maritime quarantine of Cuba during the crisis over Soviet missiles on that island. 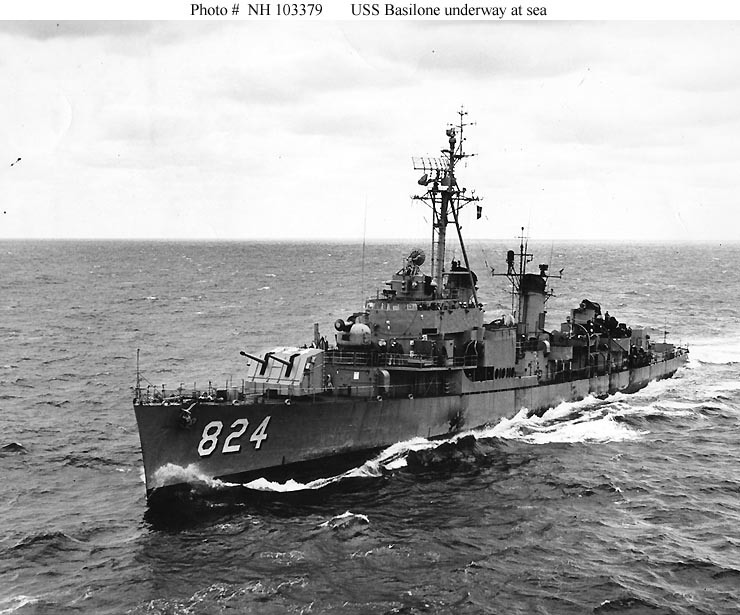 Earlier, in August 1962, Basilone had been redesignated DD-824. Between July 1963 and April 1964 Basilone underwent an extensive modernization at the Philadelphia Naval Shipyard. 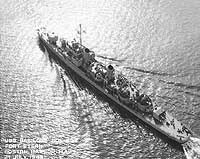 She emerged as a "FRAM I" destroyer, with a largely new superstructure, an eight-cell launcher for ASROC anti-submarine rockets, and facilities for handling drone anti-submarine helicopters. 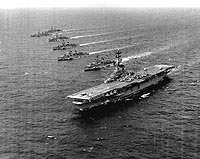 Later in 1964 she began the first of what would be, over the next thirteen years, eight more tours of duty with the Sixth Fleet in the Mediterranean Sea. 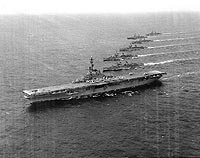 During this time she also steamed around the World twice, in 1966 and in 1972, with combat operations off Vietnam in the middle of both deployments. The last of these cruises also involved Middle East Force service and a homeward-bound passage around the Cape of Good Hope. 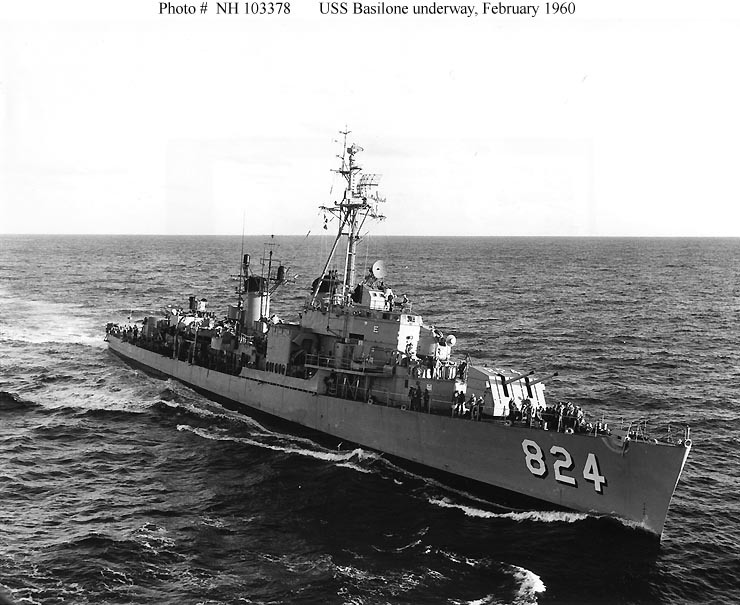 Like many of the Navy's ships, during the 1960s and 1970s Basilone suffered from problems with her steam powerplant, climaxing in a boiler explosion on 5 February 1973 that killed several members of her crew. Following repairs, she resumed operations six months later and remained quite active for another four years. 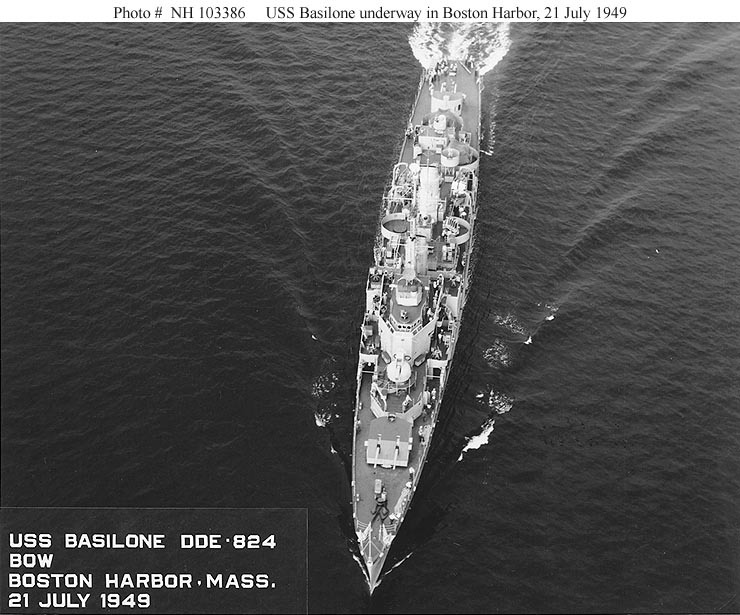 At the beginning of November 1977, after the completion of her final Mediterranean cruise, USS Basilone was decommissioned and stricken from the list of Naval vessels. Later used as a weapons target, she was sunk in the Atlantic off Florida on 9 April 1982. 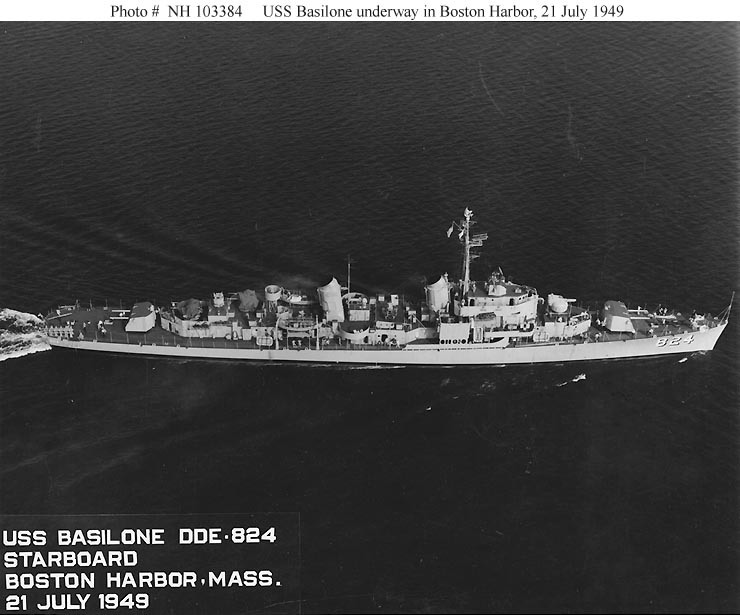 USS Basilone was named in honor of Gunnery Sergeant John Basilone, USMC, (1916-1945), who received the Medal of Honor for heroism during the Guadalcanal Campaign. 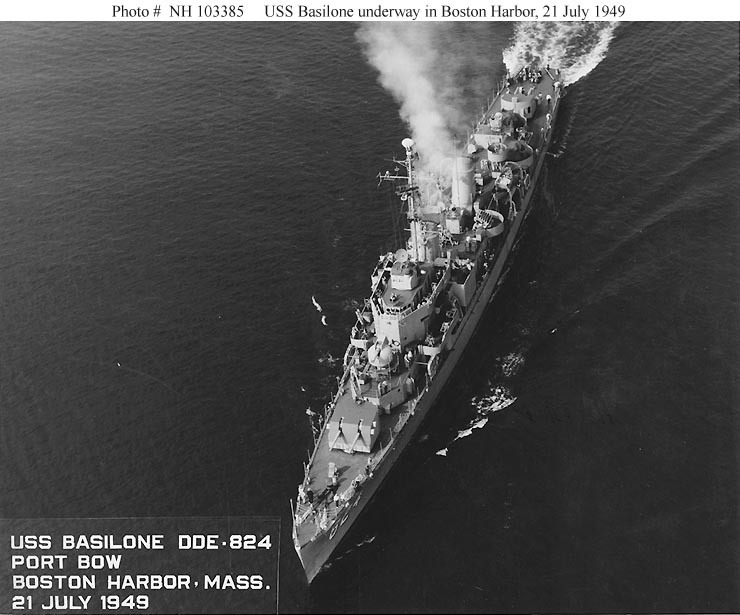 This page features all the views we have concerning USS Basilone in 1949-1963, in her DDE configuration, and provides links to later and miscellaneous images. 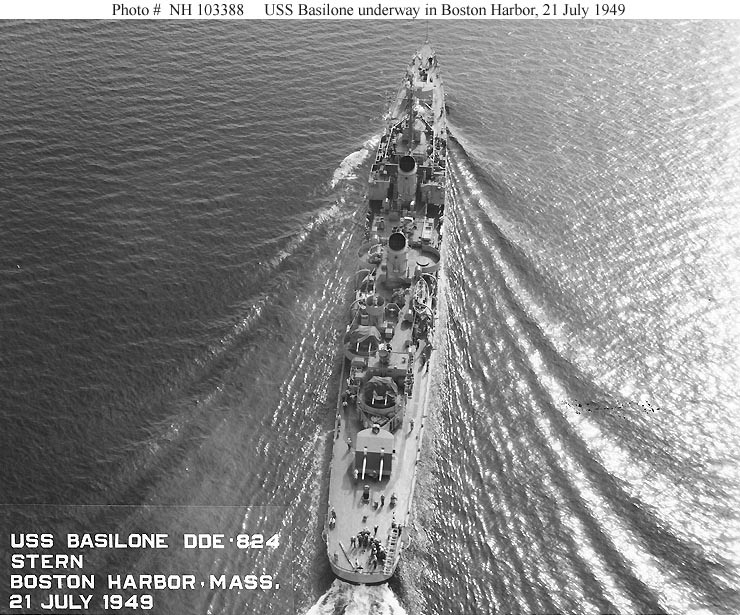 USS Basilone (DD-824) -- Miscellaneous Images. 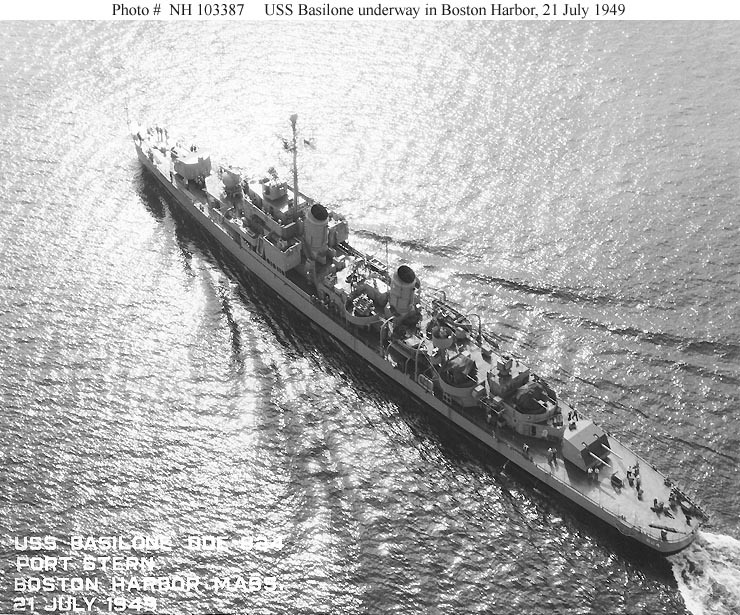 Underway in Boston Harbor, Massachusetts, 21 July 1949. Photographed by R.A. Halverson, Naval Air Station Quonset Point, Rhode Island. Note that this ship carries a trainable Hedgehog mount on her port side admidships, with provision for a second such weapon on the starboard side. 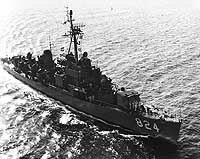 Underway, circa the early or middle 1950s. 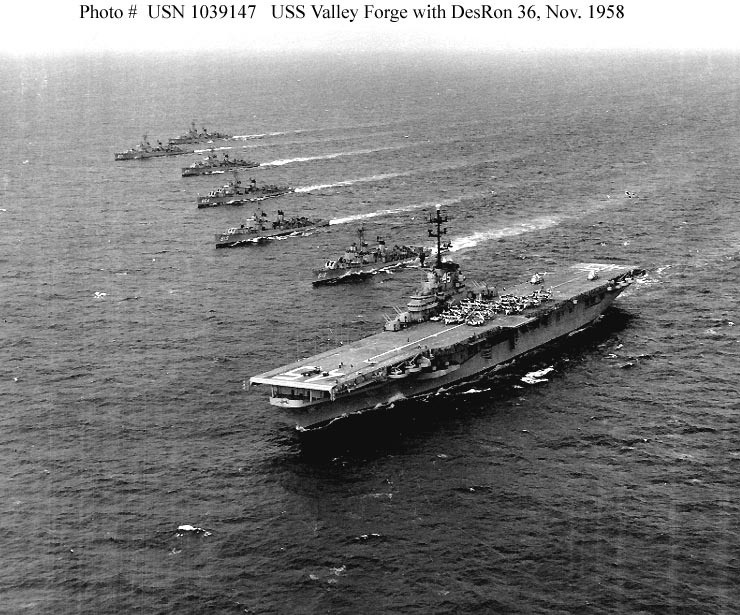 This photograph was received by the Naval Photographic Center in December 1959, but was taken several years earlier. 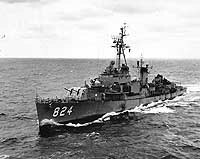 Comes alongside USS Albemarle (AV-4) to transfer personnel, 24 February 1960. Underway at sea, circa the later 1950s or early 1960s. Reproductions of this image may also be available through the National Archives photographic reproduction system as Photo # 428-N-1039147. Reproductions of this image may also be available through the National Archives photographic reproduction system as Photo # 428-N-1039321. 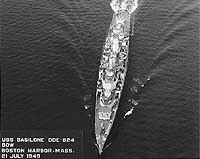 USS Basilone (DDE-824) underway in Hampton Roads, Virginia, 29 March 1952. Photographed by PH2 M. Hayman. Port broadside surface view. The ship has been refitted with a tripod foremast. 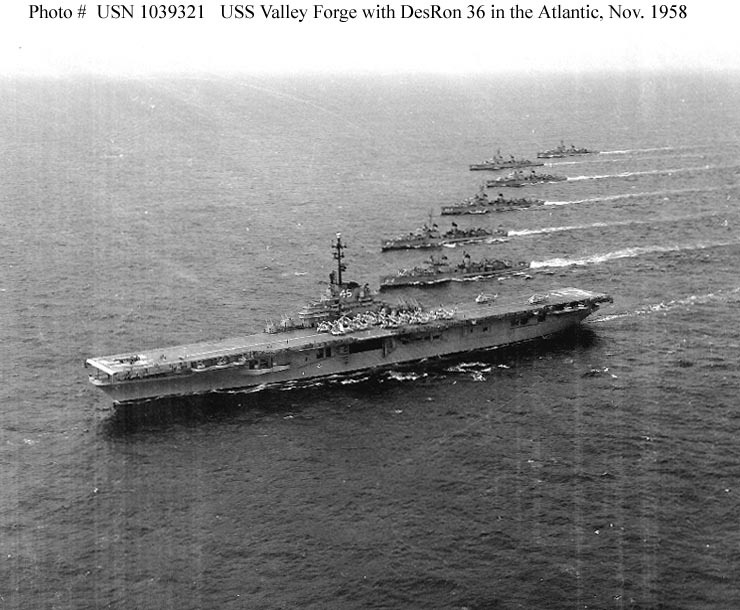 USS Basilone (DDE-824) refueling from USS Valley Forge (CVS-45) during Atlantic Fleet exercises, 9 November 1958. Photographed by Folsom. Port bow (rather tight on the bow) surface view, taken from on board Valley Forge, whose starboard side structure is visible on the right side of the image. 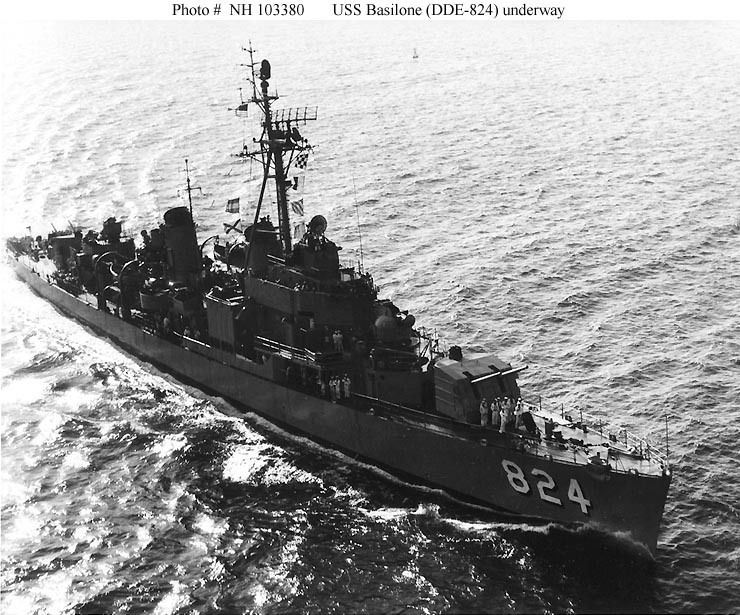 USS Basilone (DDE-824) underway on 12 August 1962. Photographed by PHC R.E. Boyer, of USS Wasp (CVS-18). Port bow high aerial view. As USN 1062364, but port quarter low aerial view.